One of the worst feelings in the world is to casually walk out to the mailbox one day only to find that you got a thick letter from the IRS. Millions of taxpayers get letters from the IRS each year, but one never expects it to be them, right? I never received an envelope until I started freelancing, and now I have gotten three letters in the last four years. Just recently ago I opened the latest one, which had to do with my 2010 tax return. When I first opened the letter, the first page said that I owed them $33,000 in taxes! Somehow they had gotten the idea that I had not reported over $71,350 in income for 2010, and with interest and penalties I now owed them a small fortune. AHH! I freaked out, I panicked, and I was racking my brain for how I could have missed $71,350 in income. How could this have happened? See, the IRS uses optical scanners to read all the tax forms that employers and tax payers send in to them. Optical scanners are not human eyes and they are not perfect. An optical scanner with very bad vision had scanned one of my 1099 forms incorrectly. The correct 1099 said that I was paid $731.50 during 2010. The IRS scanner read that as $73,150 – just a hair more than I was actually paid. A comma and its placement make all the difference in the world with that series of numbers. This is why you shouldn’t necessarily panic when you open the mailbox and find that you got a letter from the IRS. After taking the time to calm down and read the rest of the letter they sent me, I figured out where they had made an error. Phew! It wasn’t anything too scary, it was a mistake. Letters from the IRS are rarely scary, they are usually just asking for a clarification on something or for more backup paperwork. They were claiming that the 1099s they received from my various income sources didn’t match up to the gross income amount for the year, and that I hadn’t reported all of them. I had missed paying the tax due on the interest from my ING Direct account. I dug back up my 1099 forms, saw that I had all the ones they were saying I didn’t report on, and added them up. Sure enough, the dollar figure came out to what they had on file! I made some copies and pointed out in the letter that not only did I have the 1099s, but the numbers did match up. Somehow I didn’t file the return with the ING tax forms, so that was my mistake. I apologized in the letter, asked them to let me know how much I owed, and requested a waiver of interest and fees because it was a small amount and an honest mistake on end. I also mentioned the $71,350 error, pointing out where the mistake had been made. 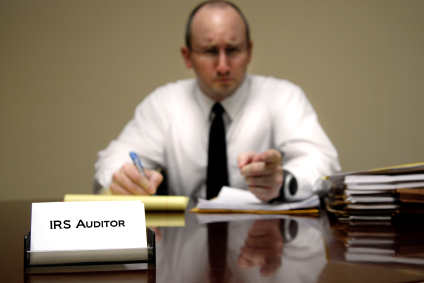 A letter from the IRS it is rarely a full-blown audit; rather it is a notice about some discrepancies on your return. This form Understanding Your IRS Notice has more information on these notices. While I still have a moment of panic when the letters do show up, I am learning that there usually isn’t anything to worry about if you are filing your taxes honestly and correctly each year. A letter stating that I owed $33,000 in taxes was scary but after taking the time to understand the issue, I was able to realize what the error was. So if you got a letter from the IRS in your mailbox, don’t fret; it’s probably just an honest mistake on either their end or yours. Read through all the paperwork, find out what is wrong, and write a polite letter back to them explaining the situation whether it’s your fault or theirs. Mistakes happen, and chances are that’s why you got a letter! Have you ever gotten a letter? Thanks for this cautionary tale, and for your clear insight. Great post! Great tips on how to deal with a letter from the IRS. I think that’s one of most people’s fear, but it’s always better not to panic and make your own computation and look for documents to support it. I think the IRS likes to perpetuate the myth of intimidation because our tax system is “voluntary”. Who knows, but those letters are scary! About 30+ years ago I received a routine office audit letter. I prepared about 6 hours for the audit and pulled together everything. I went in and got through it successfully. One of my neighbors was a former IRS prosecutor and told me the routine audit is nothing. He said, if two IRS agents show up at my office with gold badges and guns, then start sweating. They go after the real criminals. That letter would make me feel a little queasy. I would have to go back and get my mind right. I probably wouldn’t be able to sleep because I like over think things. I never got a letter and hope not to get one. If you have nothing to hide you shouldn’t panic. I try to go to the place where I pay my taxes with my return to make sure everything is fine before the final filing, some items can be tricky. Ouch! That’s one scary letter. In the UK we file our tax returns online and things are checked automatically so this shouldn’t happen…. in theory! I’ve received a couple of letters over the years from the IRS. Sometimes it’s been their error and sometimes mine. It usually is just a matter of clarifying information and correcting it…or paying the tax due. Great story and ending! Main lesson is not to panic and have your paperwork in order so you can back yourself up in case of a mistake that they made.